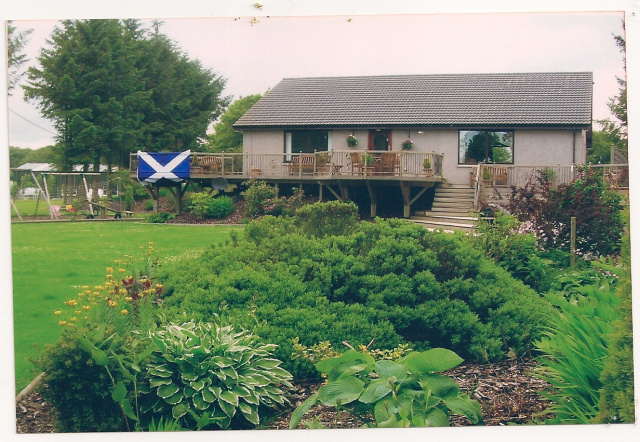 Sunnybrae is a drug rehab in NE Scotland operated by Teen Challenge for well over a decade. It is located in the bonny rolling countryside about 35 miles northwest of Aberdeen, near Fyvie. It is managed brilliantly by Pastor Gordon Cruden and staff of five or six workers backed up by a few volunteers. In the summers of 2011 and 2012, I had the pleasure of being part of a Celebrate Recovery (CR) team from Northland Church near Orlando. Our mission was to teach Celebrate Recovery's Eight Principles to the 16 residents and to give the Sunnybrae staff a week-long respite. Our team's leader, Laurie Jean Harrington, had led several mission groups there before, but about 8 or 9 years had elapsed since the last trip. Our 2011 team consisted of 12---six males and six females. The men resided at Sunnybrae and the ladies were housed and ministered at Benaiah, the ladies residence about 25 miles away. The guys team consisted of our leader Clint, Dale, Lee, Jim, Ralph and myself. The residents at Sunnybrae were mostly recovering heroin addicts. They were all men in their 20s and 30s. Some were single, some were married and some had recently been rescued from life on the streets. Basically our CR team ran the morning program for a week. We gave them a sample of a typical CR meeting with worship, an Eight Principle lesson, a 5-7 min testimony and small group sharing. The "lads" were used to the Teen Challenge ciriculum which was heavy on Christian education and teaching responsibility. Small group sharing was a realtively new experience for them, and it was well received. In the afternoon Lee and Dale got to accompany the outreach van or work crews into nearby communities. The rest of us worked around Sunnybrae with the residents. The place is immaculately maintained. Sunnybrae has a very active vocational progam focusing on construction trades, agriculture and landscaping. I was extremely impressed with their work-ethic, camraderie and Christian spirit. It struck me as very unlikely that a similarly motivated group of addicts could be found in a US residential rehab program. It destroyed my sterotype of the "typical" heroin addict. Sundays were devoted to church. Twice a day, morning and evening, the van loaded up the lads and transported them to services at King's AoG church in Aberdeen. There we met up with the ladies team and Benaiah residents for some spirited worship. Two of the 9-10 days we were there were devoted to sightseeing. We experienced a regional Highland Games at Old Meldrum and took sidetrips to the lovely seaside village of Pennan and a tour of Fyvie Castle. The 2012 team was much smaller. There were only five of us and we all (ladies included) resided at Sunnybrae. The morning format was much the same as the summer before. In the afternoon we met with local churches interested in establishing Celebrate Recovery programs or went out on the outreach van with Andrew Marjoram. On successive afternoons I went to the town square or car parks in Banff, Peterhead and Ellon. There we would set up and greet visitors with brochures about the program, conversation, tea and biscuits and prayer when needed. Being a much smaller team in 2012, I felt like my contribution was more crucial than the year before. On our last night there we had a wrap-up meeting with the residents in which we all spoke about the impact of the week's events. We had the residents write their issues down on small scraps of paper and then we went outside and burned them at the foot of a large wooden cross. When we came back into the chapel I gave the residents each a gold-colored dollar coin that no one in the US ever spends and I spoke about the importance of chips or coins as markers in 12-step programs. The lads were thrilled. As we filed out of the chapel several said, "Well done, Carl, well, done." For me, their gratitude, and their openess to our message, was the high point of this trip---or of any trip ever. Below is Sunnybrae's chapel and rec building.